Get Crimson Diamond merch on my Society6 store! Hello, dear readers! Happy March! I'm well into developing the third section of The Crimson Diamond. The intrigue gets kicked up a notch, as Nancy Maple must investigate TWO crimes! And now for some super exciting news... 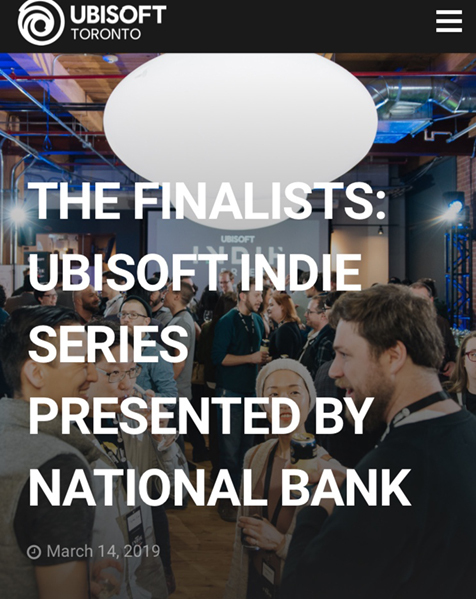 I'm a finalist in the Ubisoft Toronto Indie Series! I'm totally psyched. I get to stand in front of a panel and talk for thirty minutes about how much I love the EGA colour palette, how much I love text parser, and how with the support and mentorship of both Ubisoft Toronto and National Bank (and a $50,000 or $25,000 cash prize!) I could share my love of these things with even more people! It's a love letter, it's a Dragon's Den pitch. And I'm going to give it the same level of care and attention to detail as I have given the game so far. I help moderate the Classic Gamers Guild, so I know how much people care about adventure games. I'd love to hear your thoughts, maybe I can share them with the panel! Send them to: julia@thecrimsondiamond.com. In the previous issue of the gazette, I discussed allowing players to press and hold the arrow keys down to move Nancy around the screen. When I was watching people play the game at WordPlay 6 last year, I noticed this is what most people were attempting, but my game was lacking. Unfortunately, when I made this type of movement an option, the messages prompting players to stop and listen at doorways would clear too quickly for the player to read them! So I changed how those "listening prompt" messages were displayed, so they wouldn't be missed. This new version of eavesdropping is in the latest playable version of the demo, download and see for yourself! I can't help myself! More kumihimo braiding, as well as beaded kumihimo. The top bracelet is 8 strands, with one strand being a metallic red. And it's done in The Crimson Diamond logo colours! 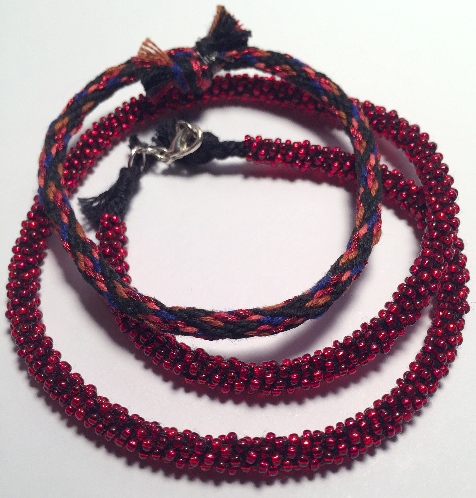 The beaded necklace is also 8 strands and uses size 11 seed beads, three different colours of red (silver-lined light red and dark red, and transparent red). Both use black embroidery floss, which is kind of a pain in the neck to use because it's pretty thick and some of the bead holes are too small! 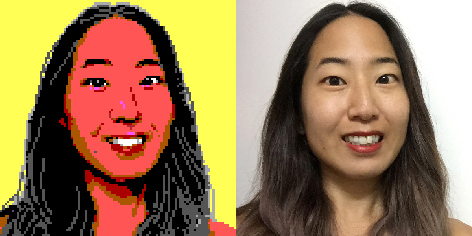 I think the necklace looks... A little pixellated? I'm thinking of buying a bead loom so I can actually make a beaded Nancy Maple. Hobbies and work collide! I'm still open for EGA art commissions! This is a self-portrait of me, with a plain background. The working size is 100pixels square. I upsize the final art so it's still crisp and clear, but still retains the beloved chunkiness of pixel art. This format is perfect for profile photos and social media avatars! This format is $100 USD. Click here for more details! I also offer payment in installments, I'm sure we can work out an arrangement to create the EGA art of your dreams. Email julia@thecrimsondiamond.com. That's all for this month, thanks for reading! DID YOU KNOW: Both garnets AND diamonds have been found in Ontario! My game is somewhat geologically accurate! Wonder what other marvelous minerals can be found in Canada? Alpine Gems has a great listing of gemstone occurrences, broken down by province. CLASSIC GAMER? JOIN CLASSIC GAMERS! I help moderate a thriving classic gaming community called the Classic Gamers Guild on Facebook. We host plenty of events during the week, as well as contests and a bunch of other great stuff. We even have a podcast and I was the first guest! Subscribe below to get this newsletter direct to your email!